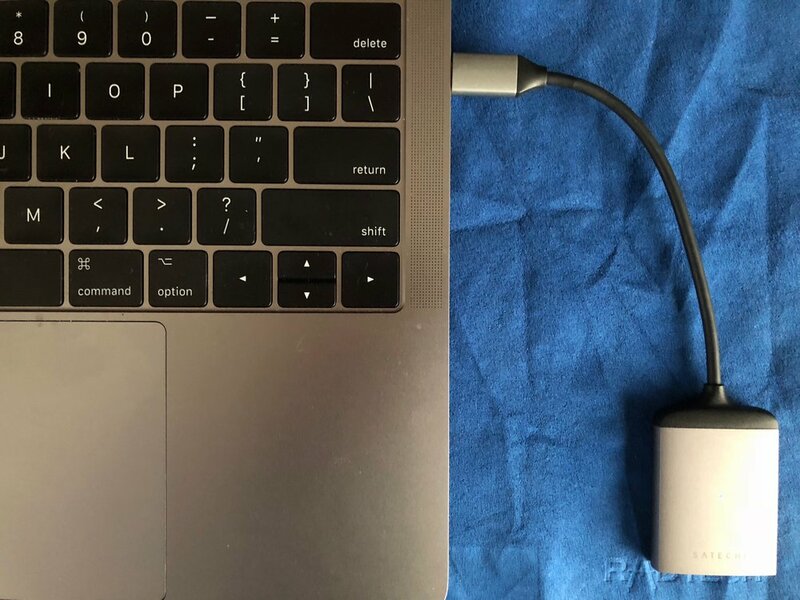 While the MacBook and MacBook Pro are equipped with the speedy Type-C USB ports, they lack a way to easily read SD and micro-USB cards from cameras and other accessories. Satechi recently released the Aluminum Type-C UHS-II Micro/SD card reader adapter (US$39.99) to address this issue, and today I'm taking a look at the new adapter. I've got to hand it to Satechi; many of their recent products are surprisingly good-looking. A case in point is this adapter, which comes in either silver or space gray and features a cable connecting the reader and USB-C plug with ample strain relief plastic. The adapter has both SD and micro-SD card readers built in, and both can be used at the same time. I like this part of the design, as there's no need for an easily-lost separate adapter "card" for the micro-SD cards. I can also see where it would be useful for transferring images from more than one device -- drones mostly use micro-SD cards while DSLRs use full-sized SD cards, so with the adapter it would be possible to read both at the same time. The size of the Aluminum Type-C UHS-II Micro/SD Card Reader is pretty small as well, measuring 2.24 x 1.46x0.42 inches (5.7 x 3.7 x 1.1 cm) and weighing just .88 ounces (25g). While the Satechi adapter supports transfer speeds of up to 312 Mbps, don't expect it to be any faster than other card readers. Transfer speeds are more dependent on the class and type of SD or micro-SD card being used than they are by the reader, so if you happen to get an SD4.0 UHS-II card, the reader will be able to keep up with that speedy format. The adapter is fully compatible with the older and slower formats such as UHS-I, SDXC, SDHC and plain old SD cards. Testing the adapter with a 16GB SD HC Class 6 card and transferring 647 image files at a total size of 4.53 GB, both the Satechi reader and my iMac's built-in reader took 4 minutes and 19.2 seconds to complete the transfer. The same was true using a 16GB Ultra Micro SD HC Class 10 card to transfer 16 files at a total size of 2.08 GB. The iMac and Satechi reader both read the files in 23.4 seconds. When the reader is plugged in, you'll know it's ready to be used as a tiny blue LED is illuminated. For MacBook and MacBook Pro users who don't have a need for a multi-port hub with built-in microSD/SD card readers, the Satechi Aluminum Type-C UHS-II Micro/SD Card Reader Adapter is an excellent choice.